UIICL United India Insurance Co. Ltd is recruiting Administrative Officers AOs in specialist and generalist discipline in 2014. Interested candidates need to apply online on UIICL official website on or before 18th Nov 2014. Click here for detailed notification and link to apply online. 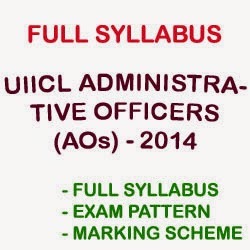 Here we are going to publish complete exam pattern, selection process, marking scheme and full syllabus for United India Insurance Company Limited AO (Administrative Officers) recruitment examination. All the eligible candidates who applied for the post shall undergo online screening test (objective type) to be conducted tentatively on 28 or 29th December 2014. The shortlisted candidates from screening test based on cut off marks shall become eligible to appear for main examination. The screening test will only be qualifying nature. 10 times the number of vacancies in each discipline/category will be called for Main exam and Descriptive online test. A candidate will be required to qualify in descriptive test, but the marks in descriptive paper shall not count for final selection. The finally qualified candidates will be called for interview upto three times the vacancies of the respective categories/discipline. Final selection will be made on the basis of performance in the online objective test (main exam) and interview. The mode of test will be online only. The Screening test and Main exam for both generalist and specialist discipline will be Objective Type (Multiple Choice Questions with only one correct answer). Questions will be both in Hindi and English except for English paper. Previous papers for UIICL AO Previous Papers. Best Books for Reasoning Ability.